To collect donations and other payments through LGL Forms, you need an integrated payment processing account. You can use Stripe, PayPal, or ProPay as your integrated payment processor. 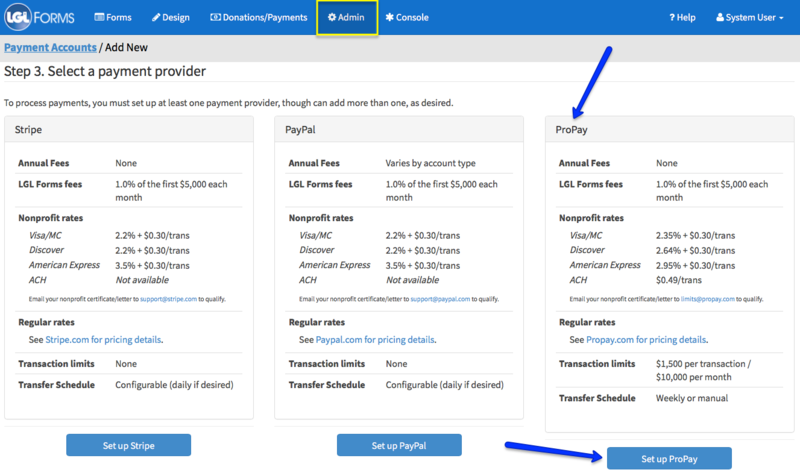 This article describes how to set up ProPay as your payment processor. LGL Forms makes it easy to create and publish online donation forms (or forms that collect payment for other reasons, such as events, or membership registration or renewal). LGL Forms is integrated with ProPay, which is a leading merchant account provider and payment processor. You'll be taken to the Admin tab, where you will need to enter a credit card in order to be able to proceed with setting up your payment gateway account. The step of adding a credit card number and any accompanying billing information in the Admin tab is required to be able to collect payments through an LGL form. Payment transactions are processed at 1% of the transaction amount, billed retroactively on a monthly basis. Once you click the Set up ProPay button, you'll be redirected to the ProPay website to set up your ProPay account and receive your ProPay account ID. Free full account. This account includes a one-year use of the JAK, which is a card reader for taking credit card payments in person (such as at an auction event). Only the online transactions will sync seamlessly with LGL. Any transactions taken over the card reader would need to be imported into LGL separately. Once you have created a ProPay account, copy your new ProPay account ID and paste it into the LGL Forms field to link your account. Listed below are three important steps to take to make the most of your ProPay account. You'll take these steps directly with ProPay. When emailing ProPay, use the address limits@propay.com and always include your ProPay account number. Let them know you're an LGL customer for expedited service. Lower your transaction rates. Qualify for the nonprofit rate by sending in a copy of your nonprofit designation letter (ie., 501c3 or 501c4 designation letter). Email a scan to limits@propay.com. Set up your bank account. In order to get money transferred from your ProPay account into your bank account, you’ll need to add your bank account information in your ProPay account. Note that funds are automatically transferred every week (early Sunday morning). If you want to turn that off, let ProPay know and they will set your account up so transfers happen only when you choose to send a transfer from your account. Raise your limits. If you expect to process more than $10,000 in transactions in a month or any one transaction greater than $1500, work with ProPay to get your limits raised. Send your organization’s three most recent credit card and bank statements to limits@propay.com. Note that limit increases will be temporary unless you expect to regularly exceed the default levels.